Mosquitos motherfuckers. My cousin and I had not planned a night of fierce fighting against those wicked demon flies, but the confrontation left dozens of fragmented corps and hundreds of milliliters of blood on the white walls, a colorless battlefield who become a holocaust, an “insecticide”, stained of red. The strategy of these “airmen” was waiting until their giant enemy shut off the lights and went into torpor, and in that deep darkness deploy the heartless attack, with proboscis instead of rifles, biological machinery to drain blood and inject venom. 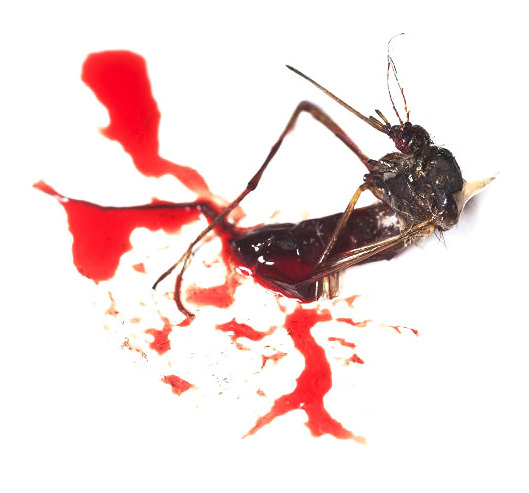 The mosquito is not a silent murderer, which attacks with stealth and discretion, it announces the onslaught with a bellicose buzz, who despairs of the enemy to the point of provoking self inflicted wounds in the form of random slapping throughout the body, mainly on the face. The mosquito does not mind alert its prey, it strips the pretense, because their modus operandi is blind, effective, withering. That night the air offensive began around 1am, the conditions were perfect for a riot of blood necessary for females and their aspirations to become mothers, progenitor of future tiny soldiers, a large army of bloodsucking bastards. The preys were 2 exhausted Mammalians, the heat made them even more susceptible, with their legs and arms free of cloth, dermis devoid of the bed sheets, to the sharp weapons of predators, as machetes with the shape of straw, stabbing needles. The semi-dormant beasts were defending themselves in a very passive way from continuous attacks, invisible ninja flying kicks, lost in the gloomy atmosphere of the bedroom: changes in position, face up, face down swing to port and starboard, on one side and on the other; sometimes protecting themselves through a thermodynamic self-torture, using as makeshift armor the coverlet and pillow on the face to reduce the contact points to little nooks of skin. The following was a slaughter, worthy of a vendetta or a “we are now even” by the Mafia, the Giants took off their shirts and using them as whips, titanic scourges, destroyed the bodies of their enemies who exploded like water balloons, leaving bloody trails on the walls and on the bed, emulating a scene from a Quentin Tarantino’s film, with a soundtrack composed by Wagner. Other mosquitos were crushed with murdering applauses, that turned the palms into cemeteries with dismembered bodies and blood that was not theirs but ours, was like deep puddles on the human flesh. The victory was a cathartic experience, it brought a sense of unfathomable release and satisfaction. This battle, with no doubt, had a winner, but we already know, Arthur and I, that tonight there will be revenge. The war is not over yet. Esta entrada fue publicada en Uncategorized y etiquetada battle of mosquitos, buzz epic poem, manufacturandoideas, manumanuti por manumanuti. Guarda enlace permanente.